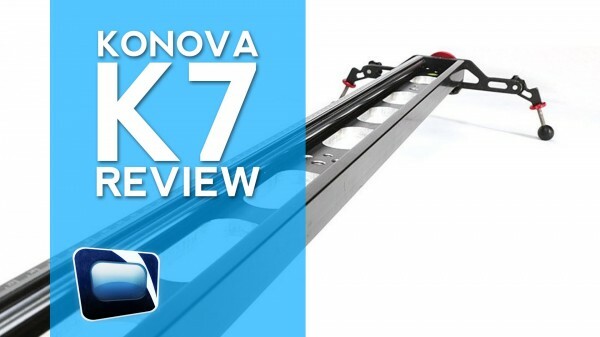 The Konova K7 slider is one of the larger options that Konova offers. The form factor is surprisingly narrow for the length, but don’t let that fool you. In our interaction with it we discovered that despite the narrow design, the slider was very stable, even with a fluid head and a medium sized camera on it. Perhaps the most important factor of a slider is how smooth it operates. With its roller bearing design, we were able to achieve very smooth and precise motion with the slider. The length lends itself to vertical moves when tilted down, though the weight of the camera may prevent stable slow moves. The slider comes with feet that attach to the end of each side. I liked this design as it allows you to quickly go from a tripod to the ground. The feet are adjustable but only by a few inches. Make sure your terrain isn’t too uneven otherwise you still may end up with a crooked shot. Pricing for the slider puts it in the mid range. It isn’t a bargain but it also is much less than some of the higher end options out there. Overall the K7 is a great option for people looking for a good all-purpose slider. It will meet the needs of DSLR and small camera shooters though larger cameras like a RED or Sony F3 may be pushing its capacity. Watch our full video review below.